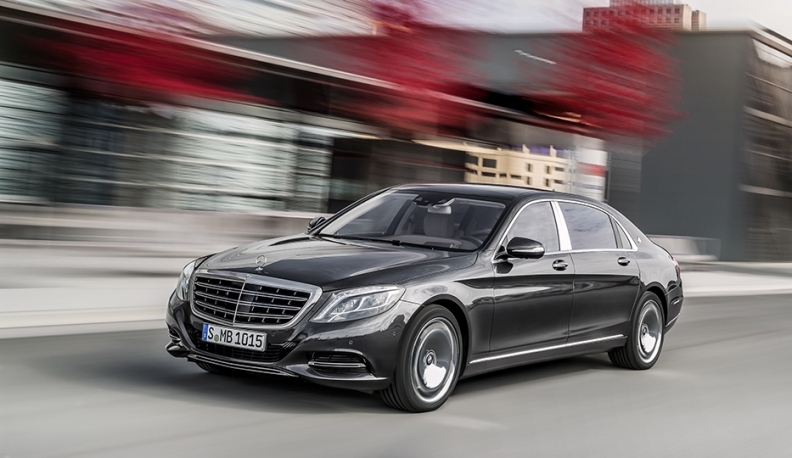 The Mercedes-Maybach sedan is 305mm (12 inches) longer than the standard S class. FRANKFURT (Bloomberg) -- Mercedes-Benz set the starting price of the Maybach S-class sedan at 134,100 euros ($166,700), including value-added tax, and began taking orders for the would-be challenger to Rolls-Royce and Bentley. The Maybach, which is longer than the standard S class, will reach showrooms in February, Mercedes said Monday in a statement. "Numerous exclusive details underline the car's ambition to lead" the chauffeured-car segment, Mercedes said. Mercedes parent Daimler is reviving Maybach as a sub-brand to regain an ultra-rich clientele as CEO Dieter Zetsche pushes for Mercedes to overtake BMW and Audi in luxury-car sales by the end of the decade. An attempt in 2002 to restore the 1930s-era Maybach marque as a stand-alone brand was halted a decade later after the cars failed to attract buyers. Mercedes fell behind BMW Group's namesake brand in premium-car deliveries in 2005, and Volkswagen Group's Audi unit has outsold Mercedes since 2011. Mercedes is using the Maybach to target buyers of BMW's Rolls-Royce nameplate and Volkswagen's Bentley marque.